Seldom will a fire officer experience a more sobering feeling than when standing in the ruins of a gutted fire-damaged building pondering the cause of the outbreak. Gulf Fire’s Consultant Editor Neil Wallington, himself a former senior British Chief Fire Officer, highlights some of the more salient principles of fire investigation work. Only experience and an appreciation of fire behaviour together with a systematic approach may lead to the correct conclusion. Past procedures for investigating fires tended to concentrate on eliminating accidental causes of fires (electrical faults, smoking, carelessness, etc), and these are still important. Nowadays, the elimination of arson as a cause is also an early priority in any investigation. The appearance of char and cracks given meaning by experimentation. Spalling of concrete interpreted as being evidence of the use of an accelerant and the condition of the concrete – whether new, sub-standard or rapidly cooled when hot. ‘V’ patterns showing evidence of fast or slow burning fires whereas size, burning rate and ventilation are the really significant manifestations of ‘V’ patterns. Inverted cone patterns interpreted as conclusive evidence of flammable liquid fires. Any burning fuel source, where the fire plume is not vertically restricted, will produce inverted cone patterns. At the scene of a vehicle fire through an alleged electrical fault when no remains of a battery can be located on board. 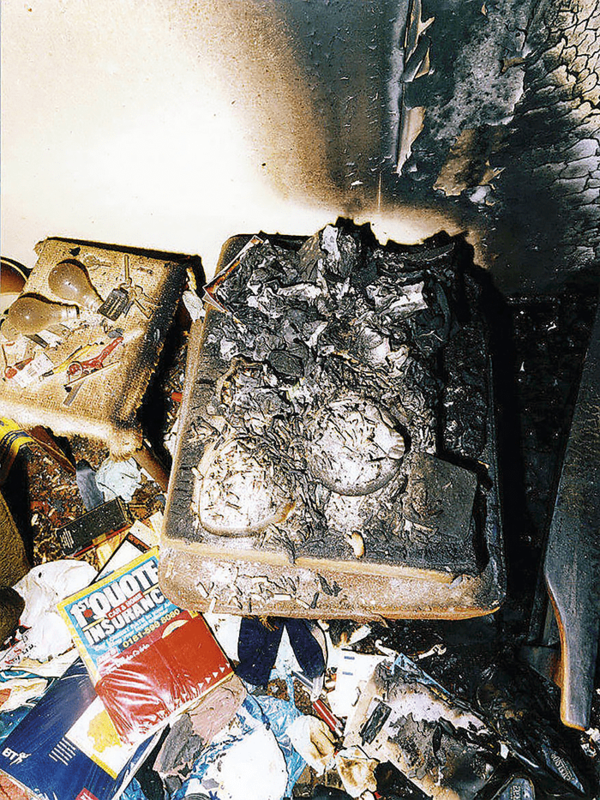 A fire caused by the careless disposal of cigarette ends. Remnants of matches, candles, rags, etc. Arson from within is frequently started by employees who endeavour to cover a crime such as embezzlement, or to express a variety of grievances. Intruders, too, can have a high profile in arson cases. Fires can cover up other crimes and economic pressure has also seen an escalation of fraud-related fires. Fire and Explosion Investigations: National Fire Protection Association (NFPA) 921. Principles of Fire Investigation: R.A. Cooke & R.H. Ide, The Institution of Fire Engineers.